Commencing with date of enrollment at a member school, a full-time student, who is in good standing according to the policies of the particular school and subject to the other limitations herein prescribed, is eligible to participate in league competitions in the MIAA. Students are considered full time and part of the school community when they take a majority of their academic classes on campus within their school, during the traditional school year. A student who has attained his/her 19th birthday before August 31 of a given academic year is not eligible to participate. A student may not represent more than one school during any academic year in interscholastic athletics regardless of its affiliation to this association. A student athlete may appeal this guideline based on a move of his primary residence of at least 30 miles. Participation, in regards to any transfer policy, is defined as practicing or scrimmaging during the regular season, beginning with the 1st try-out/practice date or playing in any interscholastic competition. Any transfer student who is deemed ineligible can practice or workout with their team, however they may not compete in any interscholastic competitions. To be eligible to participate in contests of this Association, a student must be an amateur. As such, he/she may not receive, directly or indirectly, any salary, stipend, incentive, payment, award, gratuity, gift, educational expenses or expense allowance as a result of participation in any sport or sports team. In the case of sponsored elite sport camps, amenities such as travel, accommodations and meals are considered to be acceptable gratuities. Items of a sanitary nature distributed by these camps that would not be reused by the sponsoring organization would also be considered as acceptable gratuities. Items with intrinsic value or considered as gifts (i.e. helmets, sticks, equipment bags, etc.) would not be in compliance with this policy and would need to be refused in order to protect the amateur status of the student. In order to preserve students’ eligibility for college athletics, MIAA athletes are required to adhere to the policies for avoiding “professionalism” as defined by the NCAA. a) No school, through any of its officers, representative or by any other means, shall directly or indirectly offer inducement to a student of any school, regardless of the student’s age or academic grade, to terminate enrollment at said school and migrate to another for athletic purposes. b) It is considered appropriate for a school’s admissions department to provide a student information about its school; however coaches and other members of a school’s athletic department are prohibited from contacting or communicating with a student or the student’s parents/guardians until such time as an inquiry regarding the student’s possible admission to the school has been initiated by the student’s parent/guardian through the admissions department. This policy does not preclude attendance by coaches or member school representatives to non-high school athletic events for the purpose of screening prospective student athletes. On the occasion that a prospective student athlete or his parents seek information from a member school’s representative attending a non-high school event, the school’s representative may answer preliminary questions about the member school. The school’s representative should indicate to the prospective student athlete and his parents that further contact by an athletic department representative cannot be made until the admissions department at the member school is contacted by the parents. c) MIAA schools may not initiate contact or “recruit” middle school students who are enrolled in other MIAA schools, while the students are representing their MIAA school. d) Home visits are not permitted. e) Coaches are not permitted to distribute gifts of any kind to perspective student athletes. f) Athletes being recruited to member school teams, who have not yet officially attended a day of class and regardless of age or grade, may not practice or participate with a member school team during the regular season. Additionally, they may not participate in any out of season practice or game which primarily involves players from the member school’s team. This does not apply to incoming 9th grade or transfer students who have signed enrollment contracts and are trying out for a fall team. g) The Association endorses only need-based financial aid and recommends that assistance to students be granted only on the basis of demonstrated financial need. Any member school that awards financial assistance not based upon determined need to students who participate in Association contest is required annually to submit a disclosure statement of such assistance, detailing both the number of grants and the amount of aid granted, to the Executive Director for inclusion in the Annual Report of the Association. A transfer student is one who changes enrollment from one school to another. A transfer student who changes schools during the school year and has participated in interscholastic athletics at any level at his former school is ineligible to participate in interscholastic activities for the remainder of that school year. Additionally, that student, if he/she was a varsity athlete at their previous school, is ineligible for participation in that (those) sport(s) for one calendar year from the date of enrollment. A student athlete who is by definition a varsity athlete at a member school may not become eligible to participate at another member school in the next academic year by enrolling in a non-member school for a period of less than one full academic year. Further, a students’ ineligibility to participate is based on his/her participation for the prior year only. A student who plays on a varsity team during one year and does not participate in the year prior to transfer will be eligible to play provided all other transfer criteria are met. Please refer to the definition of a “varsity athlete”. A transfer student who migrates from one member school to another and was a varsity athlete at his / her previous school is ineligible to participate in that sport at the new school for one calendar year beginning with the first date of enrollment at the new school. If that student was an undersquad athlete (freshman or junior varsity) at his previous school, he / she may transfer without penalty unless transferring under stipulations in paragraph 2. An Open Enrollment Period will be offered for non-member student athletes. From June 1 through September 1, student athletes transferring from any non-member school to a member school, may transfer to and participate in interscholastic athletics, at any level, without penalty. In order to qualify under this guideline, all appropriate paperwork must be completed and the enrollment contract deposit must be paid on or before September 1. The MIAA reserves the right to request copies of any enrollment contract. The student athlete must physically be attending classes on the first day of fall classes or by September 1. If the opening of the member school is after September 1, the required paperwork and deposit must be complete on or before the September 1st date. 30 Day Rule – A transfer student, regardless of prior participation, who transfers between September 1 and May 30 of any academic year, may not participate in a league competition of this Association until 30 days after the date of enrollment at the new school, which date may not precede the last day of the student’s attendance at the prior school. Date of Enrollment – Date of enrollment is defined as the first day the student is physically attending classes. Varsity Athlete – For transfer purposes, a non-member school varsity athlete is defined as a student who has competed in any way in a varsity interscholastic competition. In addition, an MIAA varsity athlete is defined as a student who has competed in any way in a varsity interscholastic conference competition. Participation in any non-conference scrimmages or games at the varsity level, throughout the season, does not have an impact upon the transferring student’s status. Participation and eligibility, in general, is based upon participation while in grades 9-12.
a) if a student were to change their primary residence; a change in primary residence means a move of more than 30 miles from their present residence. It does not include a temporary residence established for the purpose of athletic eligibility. b) if a student’s present school eliminates the athletic program in which he/she is participating. This transfer policy is effective as of June 1, 2009 and is non-appealable. A transfer student, regardless of prior participation may not participate in the MIAA until an Eligibility Verification Form is submitted to the league office. Eligibility Verification Forms are due to the league office upon the date of enrollment. Transfer students may practice or workout with their team, however they may not compete in any interscholastic competitions until approval is granted. For any transfer student without a verified EVF, any games played will be subject to forfeiture. Additionally, a student athlete transferring from one member school to another may not participate in interscholastic athletics until all financial obligations at the previous school have been satisfied. Proof of age (birth certificate, state issued ID or passport) is required to be submitted with the Eligibility Verification Form. A tag a long is defined as a student athlete who attends a member school and who participates in or has an interest in a sport which is not competitively offered by that member school. Tag a longs may not participate in any MIAA sanctioned regular season, individual or championship event. Middle school student athletes may not practice or compete on any high school teams, varsity or undersquad level. Any member school whose enrolled students include those in grades 6 through 8 and who field competitive teams in these grade levels would have the option to be included in sanctioned competition under the governance of the MIAA Middle School Competition Committee. While middle school athletics is a separate entity, these programs fall under the auspices of the Constitution. Female student athletes at coed member schools will be allowed to participate on MIAA sanctioned interscholastic athletic teams in any sport where a similar team is not available to them in the same sport. For clarification, a school may offer a similar team during any of the three seasons (Fall, Winter, Spring) to fulfill this requirement. As an example, the MIAA plays its tennis schedule during the Spring. A school offering a female tennis team during the Fall would preclude participation by female student athletes on the MIAA team. A female student athlete who elects to try out for an MIAA team will be required to have a waiver signed by both the student athlete and her parent/guardian to be eligible for any tryout session, practice or contest. The MIAA opposes the use of steroids or any other performance enhancing drugs by our student athletes. Due to the long term, irreversible, negative effects of performance enhancing drugs on a young athlete’s physical development, the use of such substances violates our position to ensure the health and safety of our student athletes and the promotion of competitive equity. Legal and ethical standards do not condone, support, nor permit the use of these substances. Member schools must supply official rosters to the league office by the designated calendar date or prior to the first conference game, whichever date comes first. Rosters need to include name, academic year, ‘transfer student’ status and date of birth. Any additions or subtractions to these rosters must be forwarded to the league office immediately as they occur. The league will establish a due date for rosters. Final rosters will be due at the end of season meeting. 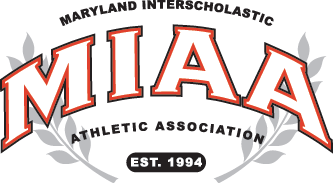 The Board of Governors and the General Council of the Maryland Interscholastic Athletic Association are increasingly concerned about the matter of sportsmanship in athletic contests and the clearly identified increase of fighting, abuse of officials, language and trash talking, and the conduct of parents and spectators. The current climate and conduct exhibited in professional and collegiate sports at contests and on television is not promoting appropriate role modeling for our student athletes, and it behooves all educators to take a leadership role in countering the increasing trend toward violent behavior and abusive situations. Fully recognizing that there are many positive occurrences in our programs, the leadership bodies of the MIAA would like to impress on the leadership of each school the necessity of taking a stand and promoting appropriate educational settings for our students in our schools and in contests between member schools. a) Hold a meeting on each campus of every coach, chaired by the athletic director and attended by the head of school (or his/her administrative delegate), to bring to the attention of coaching/teachers the proper approach to sportsmanship which would also address the issue of language, fighting, trash talking and respect for officials and opponents. b) That each season the student/athletes involved in competition be brought together under similar conditions as outlined above. c) That in each school the entire school is brought together at an appropriate gathering to have a lead administrator and athletic director outline to students the concerns so expressed. d) That each school communicates by letter to parents at the beginning of the year the school, the Association’s position on sportsmanship. If a school has a booster club or parent’s organization, these groups should be a forum for discussion of this issue. The MIAA will ask that at the end of each year a report be filed with the Association on actions taken by the member school in following these recommendations. This report should be submitted on school letterhead. If it is determined that an MIAA member school’s administration, faculty, coaches, teams, or team followers have engaged in unsportsmanlike conduct, the executive director after conferring with the executive committee may impose appropriate discipline/penalty upon such person(s) or to take other rectifying action for such conduct. The degree of discipline/penalty shall be within the discretion of the executive director after conferring with the executive committee and based upon the nature and extent of such unsportsmanlike conduct. Previous unsportsmanlike conduct shall be a contributing factor in determining the degree of discipline/penalty. Any sexualized verbal, non-verbal or physical behavior exhibited toward another individual that is intended or unintended, legal or illegal and fostered by the abuse of power and trust over the victim who considers the action to be unwanted, is not permitted. Everyone shares in the responsibility to identify and prevent this type of behavior and to develop a culture of dignity, respect and safety in sport. Social media is an integral component of today’s society. The use of such media provides for many benefits but can also be disruptive and yield negative consequences when used in an inappropriate manner. The member schools, coaches and student athletes of the MIAA are expected to utilize the capacities that social media provides in a positive and respectful manner. Social media use that promotes hurtful, harmful or negative reflection upon others is not condoned nor supported by the MIAA. No MIAA coach may coach a team in a program outside the league that affects MIAA athletes’ eligibility. A player who is ejected from a non-league game or contest (for other than physical or verbal abuse of a game official) is automatically suspended from participation in that team’s next scheduled game or contest. A player ejected before, during or after any league contest, the result of which affects the standings or playoff seedings of the competing schools, is suspended for the next scheduled league contest. In addition, the use of explicit, inappropriate and/or vulgar language will also be considered grounds for an ejection. A player ejected during a school’s final league or non-league contest must serve his suspension during his team’s next scheduled league contest to include a league championship, tournament or playoff game. If the individual’s school is not participating in the league championship tournament, the suspension carries over to the first league or non-league contest in the next year. In the event of an individual performing in a tournament, it is the next scheduled time he is to compete. The two yellow card rule (soft red) in soccer does not fall under this ruling. The two technical foul rule in basketball does not warrant an additional game suspension, unless the 2nd technical foul would warrant an ejection on its’ own. A player ejected, before, during or after a contest, for the physical or verbal abuse of a game official or for an ejection involving an altercation with an opposing player which results in attempted or actual physical contact with that player is automatically suspended for the next schedule contest, and may not participate again until a review of the ejection incident is made by the executive director. The executive director, after conferring with the individual’s head of school, athletic director and officials committee, may impose additional penalties. The Executive Director will publish ejection decisions (offense/punishment) to all member schools. The additional penalties are non appealable. Penalties issued by officials for unsportsmanlike or dangerous physical contact to another player may come under the review of the executive director and/or officials committee for additional sanctions. When a senior athlete is ejected in the final game of a fall or winter sport, the senior athlete must serve his suspension in the next interscholastic competition(s), regardless of season or sport. A coach who is ejected, before during or after a contest is suspended for the next two (2) subsequent contests which carry over to the next year. The executive director at the request of the athletic director may review the ejection incident and waive the suspension for the second contest. This request for review may be made only in writing. The executive director’s decision is non-appealable. The executive director, after conferring with the individual’s head of school, athletic director and officials committee, may impose additional penalties for a coach ejected for physical or verbal abuse of a game official. The additional penalties are non-appealable. Coaches ejected from game(s) may not be present at the game site – both for the day of the ejection and any subsequent game(s). It is the responsibility of the individual’s athletic director to enforce this rule and notify the executive director, for documentation purposes only, of the ejection and subsequent suspension. The game officials’ decisions regarding an individual’s ejection from a game or contest are final and binding; no appeals will be entertained. The officials’ committee has the discretion to consider using media/video during the review process and/or to validate an official’s report. Failure to enforce the suspension by allowing the ejected individual to participate in the subsequent contest results in the automatic forfeiture of the game or contest in which the de facto suspended individual participated. ANY PLAYER ISSUED A RED CARD OR CITED FOR FLAGRANT FOUL, MISCONDUCT OR UNSPORTSMANLIKE CONDUCT AFTER TIME HAS EXPIRED WILL SERVE A SUSPENSION AS UNDER NORMAL GAME TIME EJECTIONS. NO EJECTION IS APPEALABLE, REGARDLESS OF THE CONDITION CITED BY THE OFFICIALS TO JUSTIFY THE EXPULSION. THIS WOULD INCLUDE SERIOUSNESS OF THE FOUL OR MISINTERPRETATION OF THE RULES. Upon a finding by the executive director that a player, coach, and/or team while coaching or competing for an MIAA member school, engaged in flagrant misconduct while on the premises where a game is conducted, said player, coach and/or team may be disqualified from participating in the next scheduled game or games following said determination. The degree of penalty shall be within the discretion of the executive director after conferring with the executive committee and based upon the nature and extent of such flagrant misconduct. Previous flagrant misconduct shall be a contributing factor in determining the degree of penalty. If it is determined that an MIAA member school’s administration, faculty, coaches, teams, students, or team followers engaged in flagrant misconduct and/or conduct which violates one or more provisions of the Constitution, By-Laws or General Regulations, that member school may be directed by the executive director after conferring with the executive committee to impose appropriate discipline upon such person(s) or to take other rectifying action for such conduct. The MIAA may suggest the member school to take specified rectifying action and/or to impose specified appropriate discipline upon such person(s) as a condition for not imposing penalties upon the member school for flagrant misconduct and/or violations of the Constitution, By-Laws or General Regulations. The intent to protest must be requested and documented to the official and opposing coach at the point of the infraction before the continuation of the contest. A protest of a game, excluding a claim of the ineligibility of a player, may only be entered by the Chief Academic Administrator of the school or his/her delegate as restricted by the stipulations of Article Four, Section 1 of the Constitution. Such protest must be submitted to the Executive Director in writing and be submitted within 72 hours of the completion of the game in question; at the same time, copies must be forwarded to the Chief Administrator and Athletic Director of the opponent school. The Executive Director polls the members of the Executive Committee, in consultation with the Sport Chairperson regarding the disposition of the protest. The decision is final and binding, without recourse to any appeal. Schools not represented or excused from any monthly general meeting could be liable for a fine of $100. Schools not represented at two successive general meetings will be fined $100. Schools not represented by the proper administrator at either of the association’s two business meetings will be fined $100. Schools whose coaches do not attend the preseason or end of season meetings will be fined $100. Schools who fail to submit all conference nominees or ballots in any sport in the required time frame and prior to the actual voting will be fined $100. Schools may submit a completed ballot to the sport chair before the end of season meeting for any sport, and, should their coach not attend for any reason, the players from that school can be considered for the All MIAA team. If the school does not get approval to miss the meeting from the league in advance, the school will still be fined for lack of attendance. Required MIAA forms and /or documents, not submitted by specified deadlines, may subject offending school to fines, penalties and/or disqualification of that school’s athletes from MIAA events. Any violation of league rules reported to the league will be investigated. This investigation will commence with a complaint delivered in writing to the Executive Director by a school head. If the Executive Committee determines the concern is valid enough to warrant a hearing, they will inform the athletic director from the school being investigated. If the school is found to have violated any MIAA rules or by-laws, they could be subject to a penalty of $500 and/or disqualification of their team from competing in the MIAA playoffs or championship. This would be an appealable decision to the next higher governing body (Board of Governors). The Executive Director, in consultation with the Executive Committee, is given the authority to assess a fine and/or forfeiture for any violation of league rules. b) The Athletic Director or Head of School, through written communication to the ruling body, may request an explanation of any decision rendered by that body. The head of that body would be obliged to respond in writing within 3 days to the inquiry. A request for this explanation would not preclude the member school from filing an appeal of the decision as outlined in the appeal process. It is not acceptable for any coach or other person associated with a member school to address any member of a governance body orally or in writing with regard to these decisions. All communications must be channeled through the Head of School or the Director of Athletics. Movement between competitive levels in all sports at all levels will be done on a two-year basis. Schools must announce 15 days prior to the end of season meeting their intention to change a competitive level in any sport. A standard form should be submitted to the MIAA office. A final list of all movement requests will be submitted 3 days prior to the end of season meeting to athletic directors via email. No movement in competitive level will be considered if this timeframe is not adhered to. A school may start a new program in the middle of a two year cycle. The school may join the conference of its choice, pending approval of the Competition Committee and provided application is made prior to the end of season meeting. There will not be any conference/divisional realignment in a non-movement year, unless there are additions or subtractions to that conference in the non-movement year. Under extenuating circumstances, the Competition Committee may hear an appeal in a non-movement year from any school. All final conference movements and additions must be approved by the Competition Committee. Junior varsity teams must follow the same conference alignment at the varsity level unless otherwise requested by the Athletic Director and approved by the Competition Committee. An undersquad team participating in a conference below their varsity team is ineligible for that conference championship. If there is not a corresponding conference for that undersquad team, the team would then be eligible for that conference championship. Migration is defined as movement between lower and upper level teams in any non-conference contest. This migration is for the benefit of player development and not for support of numerical makeup of higher level teams. Migration down from upper level to lower level teams, in conference contests, should only occur if there is a danger of an under-squad team being unable to complete their schedule. Students participating in team oriented sports will be permitted to migrate between squad levels in any non-conference competition throughout the season. Students participating in individual oriented sports will follow provisions as established by the sports committee chairperson for that sport. Starting in 2016-17, any under-squad team using migrated players in conference contests is ineligible for an under-squad championship. Regardless of the league status of an athletic competition, a student may not participate in two squad levels of the same sport in the same day. (An exceptional circumstance, pending approval by the sport committee chair, may grant temporary permission for an athlete to participate in two levels on the same day). All schools will be strictly held to seasonal practice start dates. Member schools shall conduct all interscholastic athletic contests and practice during defined sports seasons. a) “Fall” means the first date of allowable practice until the final date of the MIAA championship for that sport. If a particular sport does not have a championship or post season tournament, the sport season shall end with the last regular season league contest. No member school shall participate in a post season contest without the written approval of the Executive Director. Individuals selected to participate in post season “showcases” or “all-stars” are excluded from this policy. For individual sports (cross country, squash, track, swimming, wrestling, tennis and golf), athletes may continue to participate in post season events as an “individual”, not as part of a team. For clarification, a practice is defined as an organized gathering of student athletes, supervised by a coach or coaches, for the purpose of preparing for an athletic contest or to decide the numerical make-up of a team. Athletes may participate in two different “in-season” sports. Coaches will be permitted to work with their team outside of the normal season, during the school year, for no more than three hours per week up until their seasonal start date. The three hour time period is voluntary for students and may include; agilities, practices, individual sessions, open gyms, games or contests during the week. Weekend club or rec team games/tournaments and weight training/conditioning activities are not included in this three hour limitation. The three hour time limit is cumulative for all coaches. (This includes Spring football) There are no out of season limitations for the individual sports to include: cross country, golf, squash, swimming, tennis and track. Fall teams – Summer begins June 1st and ends seven days prior to the member schools’ start date for that sport. During this time coaches can work with student athletes in any capacity. Workouts must be on a voluntary basis. The use of protective padding for football, blocking/tackling sleds or similar apparatus is prohibited and no contact is allowed. Camps are excluded. Cross Country is not included in these limitations. Winter & Spring Sports teams – Summer begin June 1st and ends the first day of Fall practice. During this time coaches can work with student athletes in any capacity. The Fall sports start date signifies the end of summer and the beginning of the out of season practice limitations for Winter and Spring teams. All scores and postponements must be phoned in by both home and visiting teams within 24 hours of the game. Any school failing to report a score within this time period will be fined $10 per violation. In the case of postponements, all contests (especially baseball and wrestling) must be rescheduled within 48 hours or the Executive Director in conjunction with the Executive Committee president will set the date and time of the game or match. Regular season varsity games must be completed 2 days prior to the start of the playoffs unless authorized by the Executive Director after consultation with the Executive Committee. A member school may not arbitrarily, intentionally, or unilaterally forfeit or cancel a scheduled competition with another member school. It is the competence of the Executive Director to determine the arbitrary or intentional nature of a forfeiture. If a contest is forfeited without authorization, the member school will be issued a $500 fine. Canceled contests approved by the Executive Director will not carry a fine. b) All teams make playoffs with seeding by most wins; tie breaker rules are applicable. c) Executive Committee, in consultation with the Calendar Committee, establishes new start date for playoffs and championship dates/venues. Member schools may be used as championship venues. The MIAA respects the autonomy of each member school to decide the number of games played in each sport. However, budget considerations and overlapping of schedules into another sport season should be taken into consideration when determining the number of games played. All MIAA varsity championships will take place at a predetermined site. When applicable, the championship site will be moved to a neutral venue. b) Cost of the facility and the size of the championship. In the event that circumstances force the loss of the neutral venue, member schools will be used in place of the scheduled venue. In the event that a school cannot participate in a championship event due to religious restrictions, a new date and venue will be announced as soon as possible. When a neutral site is used for a championship event, no team can unilaterally arrange for a practice at this site, unless provisions are made by the Executive Director to allot practice time for all participating teams. Other practice sites can be used by arrangement of individual schools. All schools must use officials sanctioned by this Association for all home games. In exceptional circumstances, the executive director has the competence to waiver this regulation. Every member school participating in varsity competition must have a Certified Athletic Trainer. Additionally, all member schools would be encouraged to have an ATC present at all home varsity events. Off campus home events should be covered through communication or where physically practical. Home teams are required to provide an athletic trainer for all varsity ice hockey games. It would also be recommended that an ATC be available for home under squad contests involving collision sports as defined by Federal Department of Education Title IX guidelines. Athletic trainers will be paid a fixed stipend for each event amounting to a previously agreed to hourly rate. This stipend will be paid for all MIAA championship events or other games or group events as determined by the league. The fee will be split among all trainers that are assigned to each event. Contests suspended by weather (act of God) will be picked up at point of stoppage, unless specified by pre-established league rules. A decision not to continue with a contest must be determined by the athletic director or another school administrator. Rescheduling should be determined by the athletic directors or in consultation with the sport committee chair. Videotaping or filming at all regularly scheduled league or non-league games is permitted. Videotaping or filming of an opponent during scrimmages or practice is strictly forbidden. All coaches should abide by a Code of Ethics which includes not “scouting” practices and scrimmages unless by prior arrangement. For Football, the standard filming should be DVD format or Hudl. If DVD: All schools are required to finalize the DVDs when recording. Unedited DVDs of two different current season games of opposing coach’s choice. Exchange must be made by Saturday at 8:00 pm of the week prior to the scheduled contest. If Hudl: Permission for two different current season of opposing coach’s choice must be granted by Saturday at 8:00pm. Home team must allow one person from visitor’s team to film from a similar location as home team. the bleachers. Cameras (or other recording devices) should not be located behind a team bench. Any school having an interscholastic athletic program, before the start of the school year, should have a well-planned crowd control program. Personnel who should be included in developing the plan are administrators, athletic director, coaches, supervisor of cheerleaders, band director, security personnel, and the game announcer. Printed copies of the final statement of the crowd control procedures should be distributed to all personnel involved in any way with the conduct of the game. The program should be developed to regulate three stages: 1) before the contest, 2) during the contest, and 3) after the contest. Specific responsibilities should be outlined for all involved. For playoffs and championship events, a designated member of the school’s administrative team (beyond the athletic director) should be present and introduced to appropriate personnel to assist with proper contest management and spectator behavior. a) Make sure that all facilities are clean and comfortable. b) Staff adequate concession stands. c) Make available to visiting schools necessary game information: include directions for game parking, location of ticket booths, seating arrangement chart, ticket prices, game time, directions for reaching the site and contest checklist. e) Designate specific seating areas for students, bands, adults, and visitors. If possible, opposing student bodies should be separated. If a reserved seating section is used, make sure that seats are clearly designated and that an usher is present. f) Discuss with the student body the need for showing good sportsmanship to visitors. An informative presentation of game rules and their interpretations might be helpful. g) Inform cheerleaders of the importance of proper timing of yells, display of good sportsmanship to visitors, and cooperation with team, band and other activities. h) Arrange for adequate police or security supervision. i) Post in plain sight at the entrance to the stadium or gym, a copy of the reasons for expulsion from the contest, e.g., use of alcohol, drugs, throwing objects, unruly behavior. j) Assign officials to dressing facilities separated from both teams. Provide escorts for the officials when it appears that disturbances may develop. a) Provide for adequate supervision of students and facilities by the home school. b) Be sure that visiting schools assume responsibility for supervising their students. c) Plan an interesting half-time program. d) To prevent long lines, assure extra help at concession stands during half-time and at breaks. e) Arrange for security to prevent fans from getting on the field, around the players’ bench area, or directly into areas of competition. f) Have the PA announcer give the location of rest rooms, concession stands, and lost & found station. g) Provide a first-aid room for emergencies. Have a doctor in attendance at home football games. Assure access to a telephone from any contest area. h) Noisemakers: The MIAA follows NFHS rules. For indoor events, do not use artificial noisemakers or noise enhancers, including, but not limited to cowbells, sirens, clackers, cans with marbles or rocks inside, air horns or any other noisemaking apparatus. Megaphones may be used only by cheerleaders, directed only toward one’s own fans. For outdoor events, the following noisemakers are prohibited: whistles, horns, and electronically enhanced noisemaking devices. A legitimate pep band is permitted under the proper supervision of a school appointed adult. a) Develop a procedural plan for the exit of teams, officials, and spectators. d) To facilitate orderly movement of traffic lines, provide directive (local police may help) supervision for cars leaving the parking area. MIAA member schools are responsible for the treatment of all visitors and officials attending games conducted by the MIAA member school. Penalties may be imposed by the executive director after conferring with the executive committee upon a MIAA member school which fails to provide reasonable protection for officials and visitors at home games. The nature and extent of any failure to provide protection shall be a guide in determining any penalty imposed. Previous violations shall be a contributing factor in determining the degree of penalty. Any penalties imposed by the executive director/executive committee in regards to discretionary disqualification (General Regulation #16), Sportsmanship (General Regulation #12), Crowd Control (General Regulation #31), that are themselves non-appealable, may be appealed to the Board of Governors as per Article Four, Section Six – Appeals and/or Article Ten, Section 2 – Membership Sanctions of the Constitution. ification: Upon a finding by the executive director that a player, coach, and/or team while coaching or competing for an MIAA member school, engaged in flagrant misconduct while on the premises where a game is conducted, said player, coach and/or team may be disqualified from participating in the next scheduled game or games following said determination. The degree of penalty shall be within the discretion of the executive director after conferring with the executive committee and based upon the nature and extent of such flagrant misconduct. Previous flagrant misconduct shall be a contributing factor in determining the degree of penalty. Action by Member School: If it is determined that an MIAA member school’s administration, faculty, coaches, teams, students, or team followers engaged in flagrant misconduct and/or conduct which violates one or more provisions of the Constitution, By-Laws or General Regulations, that member school may be directed by the executive director after conferring with the executive committee to impose appropriate discipline upon such person(s) or to take other rectifying action for such conduct. The MIAA may suggest the member school to take specified rectifying action and/or to impose specified appropriate discipline upon such person(s) as a condition for not imposing penalties upon the member school for flagrant misconduct and/or violations of the Constitution, By-Laws or General Regulations. 17. Fines and Penalties Schools not represented or excused from any monthly general meeting could be liable for a fine of $100. Schools not represented at two successive general meetings will be fined $100. Schools not represented by the proper administrator at either of the association’s two business meetings will be fined $100. Schools whose coaches do not attend the preseason or end of season meetings will be fined $100. Schools who fail to submit all conference nominees or ballots in any sport in the required time frame and prior to the actual voting will be fined $100. (Additionally, any player nominated for the team, whose coach is not excused from the meeting by the committee chair and/or does not submit a ballot prior to the meeting, will not be considered for inclusion on the team.) Required MIAA forms and /or documents, not submitted by specified deadlines, may subject offending school to fines, penalties and/or disqualification of that school’s athletes from MIAA events. Any violation of league rules reported to the league will be investigated. This investigation will commence with a complaint delivered in writing to the Executive Director by a school head. If the Executive Committee determines the concern is valid enough to warrant a hearing, they will inform the athletic director from the school being investigated. If the school is found to have violated any MIAA rules or by-laws, they could be subject to a penalty of $500 and/or disqualification of their team from competing in the MIAA playoffs or championship. This would be an appealable decision to the next higher governing body (Board of Governors). The deliberate or inadvertent violation of the conditions of a student-athlete’s eligibility results in the forfeiture of all contests in which the ineligible student participated. It is the competence of the Executive Director, upon his own or any member school’s initiative, to judge the eligibility status of a student-athlete. The Executive Director, in consultation with the Executive Committee, is given the authority to assess a fine and/or forfeiture for any violation of league rules. 18. Governance Decisions As per Article Four of the MIAA Constitution, any member school wishing to address a concern over a decision by any governance body may do so in one of two ways: a) File an appeal as outlined in Article Four, Section Eight of the Constitution b) The Athletic Director or Head of School, through written communication to the ruling body, may request an explanation of any decision rendered by that body. The head of that body would be obliged to respond in writing within 3 days to the inquiry. A request for this explanation would not preclude the member school from filing an appeal of the decision as outlined in the appeal process. It is not acceptable for any coach or other person associated with a member school to address any member of a governance body orally or in writing with regard to these decisions. All communications must be channeled through the Head of School or the Director of Athletics. 19. Movement Between Conferences Movement between competitive levels in all sports at all levels will be done on a two-year basis. Schools must announce 15 days prior to the end of season meeting their intention to change a competitive level in any sport. A standard form should be submitted to the MIAA office. A final list of all movement requests will be submitted 3 days prior to the end of season meeting to athletic directors via email. No movement in competitive level will be considered if this timeframe is not adhered to. A school may start a new program in the middle of a two year cycle. The school may join the conference of its choice, pending approval of the Competition Committee and provided application is made prior to the end of season meeting. There will not be any conference/divisional realignment in a non-movement year, unless there are additions or subtractions to that conference in the non-movement year. Under extenuating circumstances, the Competition Committee may hear an appeal in a non-movement year from any school. All final conference movements and additions must be approved by the Competition Committee. 20. JV Conference Alignment Junior varsity teams must follow the same conference alignment at the varsity level unless otherwise requested by the Athletic Director and approved by the Competition Committee. 21. Migration Between Squad Levels Migration is defined as movement between lower and upper level teams in any non-conference contest. This migration is for the benefit of player development and not for support of numerical makeup of higher level teams. Migration down from upper level to lower level teams, in conference contests, should only occur if there is a danger of an under-squad team being unable to complete their schedule. Students participating in team oriented sports will be permitted to migrate between squad levels in any non-conference competition throughout the season. Students participating in individual oriented sports will follow provisions as established by the sports committee chairperson for that sport. Squad level migration requests for conference contests must be made in writing to the sports committee chairperson prior to this migration. Requests must indicate the reasons for the migration and the names and positions of the players to be considered. (In emergency situations a school may request temporary migration of a specialty position player without impact upon the championship status of the under-squad team.) Starting in 2016-17, any under-squad team using migrated players in conference contests is ineligible for an under-squad championship. Regardless of the league status of an athletic competition, a student may not participate in two squad levels of the same sport in the same day. (An exceptional circumstance, pending approval by the sport committee chair, may grant temporary permission for an athlete to participate in two levels on the same day). 22. Start Dates / Sports Season/ Practices / Out of Season Practices All schools will be strictly held to seasonal practice start dates. Member schools shall conduct all interscholastic athletic contests and practice during defined sports seasons. The sport season shall be defined as: a) “Fall” means the first date of allowable practice until the final date of the MIAA championship for that sport. b) “Winter” means the first date of allowable practice until the final date of the MIAA Championship for that sport. c) “Spring” means the first date of allowable practiced until the final date of the MIAA Championship for that sport. If a particular sport does not have a championship or post season tournament, the sport season shall end with the last regular season league contest. No member school shall participate in a post season contest without the written approval of the Executive Committee. Individuals selected to participate in post season “showcases” or “all-stars” are excluded from this policy. For individual sports (cross country, squash, track, swimming, wrestling, tennis and golf), athletes may continue to participate in post season events as an “individual”, not as part of a team. For clarification, a practice is defined as an organized gathering of student athletes, supervised by a coach or coaches, for the purpose of preparing for an athletic contest or to decide the numerical make-up of a team. Athletes participating on an in-season team cannot participate with another out of season team. Athletes may participate in two different “in-season” sports. First day of fall practice through May 31st (School Year): Coaches will be permitted to work with their team outside of the normal season, during the school year, for no more than three hours per week up until their seasonal start date. The three hour time period is voluntary for students and may include; agilities, practices, individual sessions, open gyms, games or contests during the week. Weekend club or rec team games/tournaments and weight training/conditioning activities are not included in this three hour limitation. The three hour time limit is cumulative for all coaches. (This includes Spring football) There are no out of season limitations for the individual sports to include: cross country, golf, squash, swimming, tennis and track. Summer Season: June 1 through seven days prior to the member schools’ start date for that Fall Sport June 1 through the Start of Fall Practice (All other Sports) Fall teams – Summer begins June 1st and ends seven days prior to the member schools’ start date for that sport. During this time coaches can work with student athletes in any capacity. Workouts must be on a voluntary basis. The use of protective padding for football, blocking/tackling sleds or similar apparatus is prohibited and no contact is allowed. Camps are excluded. Fall sports teams may utilize weight training and conditioning activities only. Any instruction, drills, scrimmages, station work or any activity involving equipment for that sport is prohibited. Cross Country is not included in these limitations. Winter & Spring Sports teams – Summer begin June 1st and ends the first day of Fall practice. During this time coaches can work with student athletes in any capacity. The Fall sports start date signifies the end of summer and the beginning of the out of season practice limitations for Winter and Spring teams. 23. Postponements / Emergency Scheduling Plan All scores and postponements must be phoned in by both home and visiting teams within 24 hours of the game. Any school failing to report a score within this time period will be fined $10 per violation. In the case of postponements, all contests (especially baseball and wrestling) must be rescheduled within 48 hours or the Executive Director in conjunction with the Executive Committee president will set the date and time of the game or match. Regular season varsity games must be completed 2 days prior to the start of the playoffs unless authorized by the Executive Director after consultation with the Executive Committee. A member school may not arbitrarily, intentionally, or unilaterally forfeit or cancel a scheduled competition with another member school. It is the competence of the Executive Director to determine the arbitrary or intentional nature of a forfeiture. If a contest is forfeited without authorization, the member school will be issued a $500 fine. Canceled contests approved by the Executive Director will not carry a fine. In the event of an Act of God or any other crisis that demands scheduling alternatives, the following plan will be initiated: (A decision of whether to implement the emergency scheduling plan will be made by the Executive Director after consultation with the Executive Committee and the Board of Governors.) a) Freeze all games and scrimmages b) All teams make playoffs with seeding by most wins; tie breaker rules are applicable. c) Executive Committee, in consultation with the Calendar Committee, establishes new start date for playoffs and championship dates/venues. d) Executive Director in consultation with the Executive Committee may determine the top two teams to participate in an undersquad championship Member schools may be used as championship venues. 24. Seasonal Game Limitations The MIAA respects the autonomy of each member school to decide the number of games played in each sport. However, budget considerations and overlapping of schedules into another sport season should be taken into consideration when determining the number of games played. 25. Championship Venues All MIAA varsity championships will take place at a predetermined site. When applicable, the championship site will be moved to a neutral venue. Championship venues will be based on the following criteria: a) Revenue or non-revenue sport b) Cost of the facility and the size of the championship. In the event that circumstances force the loss of the neutral venue, member schools will be used in place of the scheduled venue. In the event that a school cannot participate in a championship event due to religious restrictions, a new date and venue will be announced as soon as possible. When a neutral site is used for a championship event, no team can unilaterally arrange for a practice at this site, unless provisions are made by the Executive Director to allot practice time for all participating teams. Other practice sites can be used by arrangement of individual schools. 26. Officials All schools must use officials sanctioned by this Association for all home games. In exceptional circumstances, the executive director has the competence to waiver this regulation. 27. Athletic Trainers Every member school participating in varsity competition must have a Certified Athletic Trainer. Additionally, all member schools would be encouraged to have an ATC present at all home varsity events. Off campus home events should be covered through communication or where physically practical. It would also be recommended that an ATC be available for home under squad contests involving collision sports as defined by Federal Department of Education Title IX guidelines. Athletic trainers will be paid a fixed stipend for each event amounting to a previously agreed to hourly rate. This stipend will be paid for all MIAA championship events or other games or group events as determined by the league. The fee will be split among all trainers that are assigned to each event. 28. Thunder/Lightning Policy Contests suspended by weather (act of God) will be picked up at point of stoppage, unless specified by pre-established league rules. A decision not to continue with a contest must be determined by the athletic director or another school administrator. Rescheduling should be determined by the athletic directors or in consultation with the sport committee chair. 29. Videotaping Videotaping or filming at all regularly scheduled league or non-league games is permitted. Videotaping or filming of an opponent during scrimmages or practice is strictly forbidden. All coaches should abide by a Code of Ethics which includes not “scouting” practices and scrimmages unless by prior arrangement. For Football the standard filming should be DVD format. Regarding film exchange: Unedited DVDs of two different current season games of opposing coach’s choice. Exchange must be made by Saturday at 8:00 pm of the week prior to the scheduled contest. Home team must allow one person from visitor’s team to film from a similar location as home team. For volleyball, all filming should be conducted from the end of the court, corner of the court, or top row of the bleachers. Cameras (or other recording devices) should not be located behind a team bench. 3) after the contest. Specific responsibilities should be outlined for all involved. During the Contest a) Provide for adequate supervision of students and facilities by the home school. b) Be sure that visiting schools assume responsibility for supervising their students. c) Plan an interesting half-time program. d) To prevent long lines, assure extra help at concession stands during half-time and at breaks. e) Arrange for security to prevent fans from getting on the field, around the players’ bench area, or directly into areas of competition. f) Have the PA announcer give the location of rest rooms, concession stands, and lost & found station. g) Provide a first-aid room for emergencies. Have a doctor in attendance at home football games. Assure access to a telephone from any contest area. h) Noisemakers: The MIAA follows NFHS rules. For indoor events, do not use artificial noisemakers or noise enhancers, including, but not limited to cowbells, sirens, clackers, cans with marbles or rocks inside, air horns or any other noisemaking apparatus. Megaphones may be used only by cheerleaders, directed only toward one’s own fans. For outdoor events, the following noisemakers are prohibited: whistles, horns, and electronically enhanced noisemaking devices. A legitimate pep band is permitted under the proper supervision of a school appointed adult. d) To facilitate orderly movement of traffic lines, provide directive (local police may help) supervision for cars leaving the parking area. MIAA member schools are responsible for the treatment of all visitors and officials attending games conducted by the MIAA member school. Penalties may be imposed by the executive director after conferring with the executive committee upon a MIAA member school which fails to provide reasonable protection for officials and visitors at home games. The nature and extent of any failure to provide protection shall be a guide in determining any penalty imposed. Previous violations shall be a contributing factor in determining the degree of penalty. Any penalties imposed by the executive director/executive committee in regards to discretionary disqualification (General Regulation #16), Sportsmanship (General Regulation #12), Crowd Control (General Regulation #30), that are themselves non-appealable, may be appealed to the Board of Governors as per Article Four, Section Six – Appeals and/or Article Ten, Section 2 – Membership Sanctions of the Constitution.